What happened to Monocentropus lambertoni? Discussion in 'Tarantula Chat' started by JAFUENTES, Jan 14, 2019.
Who has them in the states? This species is like a ghost and I haven't found anything on them. Any ideas? All highly appreciated. They are very rare in the US, not sure if they have even made it there yet. They are very rare in the hobby everywhere. I have sent some adults over to the US in past couple of years, but no males to even send over. I have seen a couple European sellers with females for sale. Is it odd that I’ve only seen females of this species listed for sale and never males? I personally wouldn’t drop the guap on one unless I knew there’s a make out there I could breed it with. I have had a friend here in Sweden who had an adult female many years ago. But he is not in the hobby anymore and has sold of his collection! Who has bought it, i have no clue!? It only seems to be females in the hobby I'm honestly struggling to understand it how do we have any slings without the male? Probobly they where collected from the wild, and only females where collected, and no breeding has occurd in captivety??? I have not heard of any breeding what so ever!? I am hoping that was done legally through the proper importation process and thumbs up if it was. Slings and or "Monocentropus lambertoni-juv(1.5-2in)" have been sold stateside by myself (Only had a handful so did not advertise here If I recall) as well as others .....a search here in the for sale section would bring up others who sold them in the U.S. or to the U.S. illegally at the time. I have heard no breeding success here in the states and there was little knowledge on them at the time. If I recall correctly a specific member and customer I had was working on them http://arachnoboards.com/members/tonys-spiders.61239/ . Again I believe he had no success and I have not seen him active in the hobby for some time (wish him well). We have now established balfori as being able to be kept communally and since my first failed attempt in the U.S. on balfori many others and myself have bred and circulated them abundantly. If we had the same knowledge of balfori I wonder if the success rate would have been better with leaving the young with mom etc...if that is true for lambertoni as well. I know a sac was produced overseas recently, but very few were viable and they were held back for breeding and not offered to me at this time. Where did you see slings for sale? I didn't think there were any. There were a couple females for sale last year in the US. I thought about it for a brief moment, but what’s the point when it’s virtually impossible to find a male. Hope someone can crack this species eventually (and legally). I think that was their point... we're not going to get any slings without new males. Unfortunately this is a rare and hard to breed species. In the last ten years or so I've seen M. lambertoni slings for sale in the US one time, and I'm not expecting to see them again any time soon. Those were imports and they've never been bred in the United States. Even in Europe it seems there's been limited success, though there was a small sac (!) recently as Joe mentioned. Apparently the difficult is not the pairing (they are communal and mate easily) but inducing them to drop the sac/getting a viable sac. Very successful and experienced breeders have tried this numerous times over here without any luck, sadly. 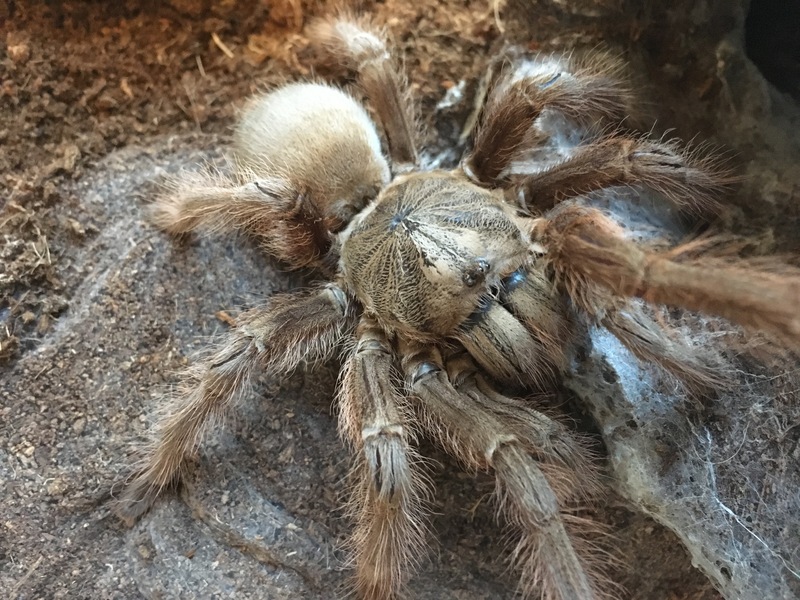 I managed to pick up my female several years ago from a breeder who had originally gotten it as a WC adult and had no success after his pairings... meaning it could certainly be 15 or 20+ years old at this point. I'm very glad that someone is managing to keep them in the hobby, however tenuously! Unique spiders that I'd love to see more of some day. i am aware of one MM of the species that should be heading to the US in the near future. Hopefully there is a successful sac and a 'colony' can be started. There's a bit of debate over the question if M. lambertoni actually belongs in the genus Monocentropus and even more debate over the question whether they are really communal or not - I wouldn't really bet on it from all I've read and heard about. @KezyGLA I know you had a colony, what was your experience? Definitely. What we have in the hobby under this name could very well be a different species from Madagascar. The original description of M. lambertoni is from the 1920s and almost useless in terms of making an actual ID. As far as the “communal” issue, I’ve seen them living in groups on video and whatnot but I’d imagine it depends on how one defines communal.